I’m glad there are philosophers who wrestle with what there actually is in the world — for real. So the rest of us can deal with practical matters. That’s a glib summation of how I contrast C.S. Peirce’s pragmatism with adventures in contemporary ontology. The task for one such ontologist, Graham Harman, is to give space and dignity to the universe of objects out there independently of human perception, interpretation and purpose — continuing the contemporary intellectual assault on anthropocentrism. For Harman there are sensual objects that we perceive (such as this keyboard, water bottle and wallet) and real objects (the same, but frequently out of my conscious awareness). Then there are the qualities of these objects: some are seen and available to my awareness — sticky, cool, empty (sensual qualities); most others are hidden from view (real qualities). That provides Harman with a 4-fold schema, with ten possible relationships between objects and qualities. He labels the various relationships with terms such as confrontation. “What we really need is a term applicable to the primitive psyches of rocks and electrons as well as to humans. I propose the word confrontation as sufficiently broad for the task. Wakeful humans confront strawberries and commando raids, a sleeper confronts the bed, and a pebble confronts the asphalt that it strikes as opposed to all the accidental details of the asphalt” (103). He has other terms to describe object-quality relationships such as fusion, allure, and causation. His human-sounding relationships between things do not project “human properties onto the non-human world” (46). For Harman, the crude comprehensions exercised between “minerals and dirt are no less relations than are the sophisticated mental activity of humans” (46). Human mental activity is but a subset of something that is going on between objects in the world already: “Instead of placing souls into sand and stones, we find something sandy and stony in the human soul” (46). Suddenly, Peirce’s explanations of the importance of signs and the communicative structures within and between all things seems a lot simpler to me than ontology, and more useful. I think that semiotics provides what post humanists (like Harman) want – a means of according agency, autonomy and meaning to things like rocks and stones outside of what humans say about them. For the semiotician, the world is already caught up in sets of communicative relationships, of a field of signs, into which we human agents participate from time to time. As it happens, I draw on Peirce’s semiotic account, as expanded and developed by others, to advance an understanding of natural systems, in Network Nature, due out early April 2018. My advance copy is just out. Coyne, Richard, 2018. 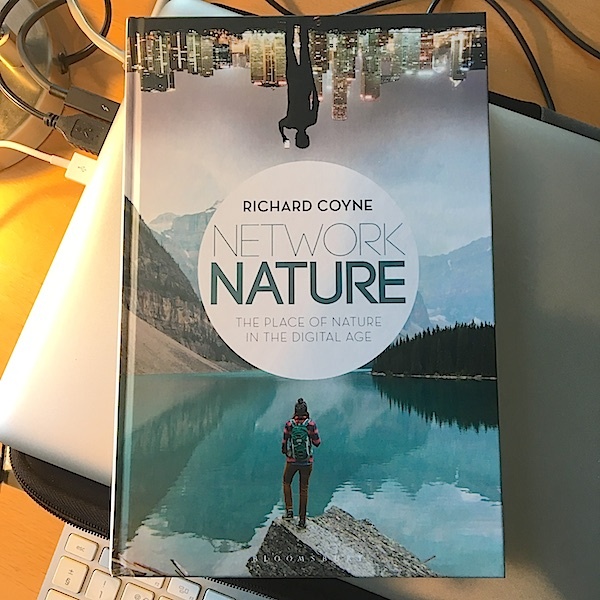 Network Nature: The Place of Nature in the Digital Age, London, Bloomsbury Academic. Harman, Graham, 2011. The Quadruple Object, Winchester, England: Zero Books. 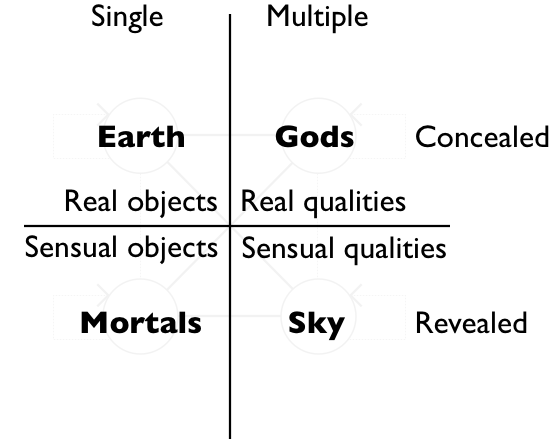 On the subject of Heidegger’s fourfold, as described by Harman, Earth and Mortals tend to be singular entities; Gods and Sky pertain to multiples. Earth and Gods tend to be concerned with concealment; whereas Mortals and Sky are about what gets revealed and exposed. Objects are singular, but each with multiple qualities. Real objects and qualities are hidden from us, but sensible objects are revealed and exposed. So Harman translates (or demythologizes) Heidegger’s fourfold into a fourfold object ontology: real objects, real qualities, sensual objects, sensual qualities.